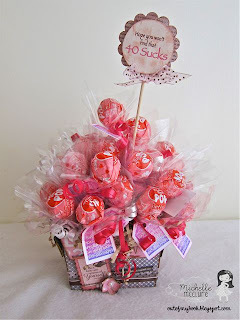 Pages From the Heart: Lollipop Tutorial! I hope you enjoyed Michelle's Lollipop Centerpiece yesterday - I'm thinking about making one for St. Patricks for the kids in Adam's class! Adam would have fun helping me decorate the base and it would be cute for their little party! Today, Michelle is sharing the tutorial so that you can create one of these for any occasion as well! For some reason, whenever I think of handmade embellishments, I always associate that with making flowers. I wanted to make something a little different than usual, so I thought why not use candy as the centers? Then the recipient can have something tasty to take home with them. 1. Cut cellophane into 4 x 4" squares. Hole punch the center. 2. Insert lollipop into the hole. 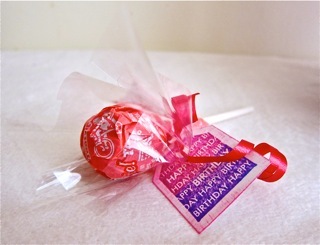 Gather the cellophane under the candy part and tape it onto the stick using clear tape. 3. 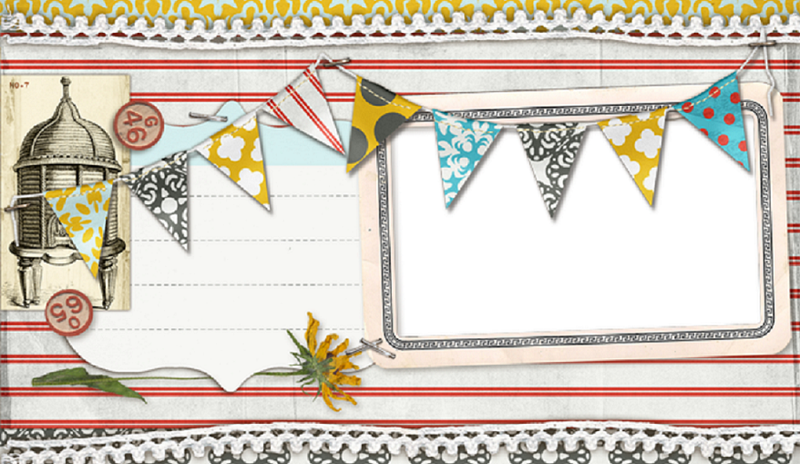 Write or stamp your sentiment onto a piece of cardstock. 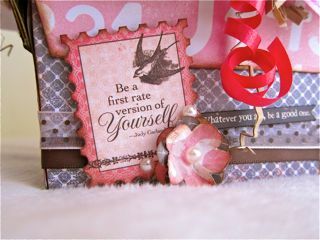 Cut or punch out into a tag shape. Hole punch at the top. 4. 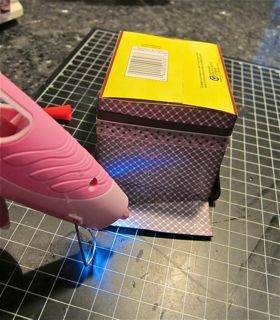 Attach your tag onto the stick with curling ribbon. Now you have the individual lollipop flowers. Arrange them together in a base using floral foam to hold it in place and now you have your bouquet. 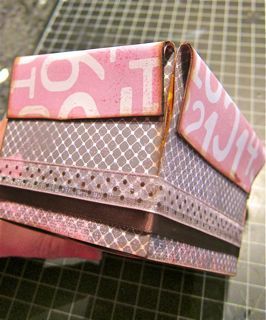 You can change up the design by using patterned papers instead of cellophane or punching out a different shape for the tag. Choose a shape you like. For my base, I used a Triscuit Thin Crisp box because I liked how the sides tapered in, reminding me of the shape of a flower pot. 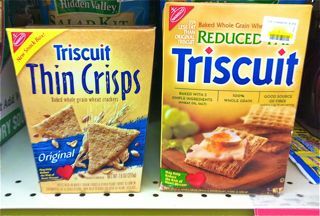 The regular Triscuit box has straight edges since it is a standard rectangular prism. Choose the right scale. 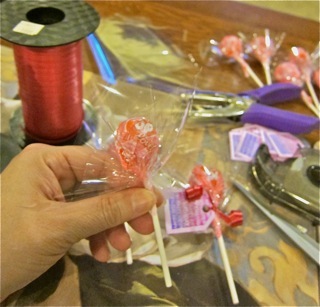 The lollipops seem too short when compared to the size of the whole box, so I had to cut the box down. Cover it up. 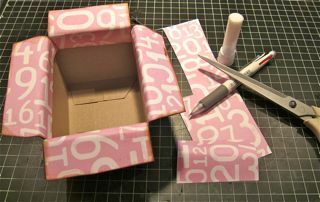 I traced each side of the box onto the back of a piece of patterned paper and cut it out. 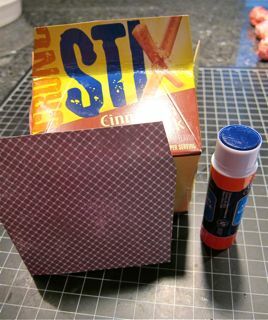 I glued each piece onto the box using a glue stick. No one will every know the origins of the base from just looking at it. Play with your shape. I wanted to create a brim like on a flower pot, so I covered the inside of the flaps and folded it over. Use the right adhesive for the job. Since the flap is cardboard instead of paper, I hot glued the flaps down to secure it in place. Put on your own finishing touches. I chalked the edges and wrapped the box with some ribbons. I finished decorating with some die cuts, punched flowers and pearls. So cute! Thanks, Michelle! 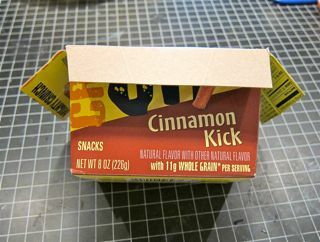 I love repurposing the box - such a great idea! I love projects where you have almost all of the supplies on hand! I think we'll be running out to grab a bag of lolli's and a roll of cello! Well see you tomorrow with Debbie's project!